This 7'' was released as a teaser single to the Lifeguards LP Waving at the Astronauts, released in early 2011. The recording combo of Bob Pollard and late '90s/early '00s GBV guitarist Doug Gillard were back with their first batch of songs as Lifeguards since 2003 and their previous full-length, Mist King Urth. 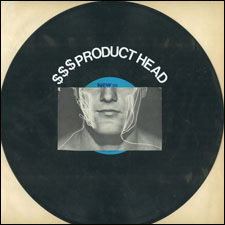 Product Head- Same version as on Waving to the Astronauts. Naught Windsor-2 Doug Gillard instrumental, essentially. Rather sleazy sounding 70's/'early '80s rocker. Guitar noodling lead that wreaks of leather, studs, dark city streets, and dated-as-bloody-hell music video clips. Pollard provides some back-up vocals, for effect only, and to get some song credit. Worth a spin, and then another to hear it again and give a slight shudder. Gillard can certainly shred, but yeah.... sigh. b-sides.